It’s beginning to look a lot like Christmas, ev-rywhere you go. From the Macy’s Holiday Parade in the morn to the holiday tree lighting in the evening, TriMet takes you to the holiday kickoff festivities in Portland City Center on Friday, Nov. 27. Avoid the parking hassles; hop on any MAX line or bus line that runs into downtown. Plan your trip to the My Macy’s Holiday Parade using TriMet’s online trip planner. The parade begins at 9 a.m. and goes through about 11:00 a.m. Nine bus lines will be detoured from 8:30 a.m. until after the parade. Get off one stop before or after to reach the square. Big crowds are expected to turn out for the tree lighting, which is the official kickoff for the holiday season. Whether on the TriMet system, at the Square or elsewhere in downtown Portland, be aware of your surroundings. If you see something suspicious, say something to a TriMet employee, a police or security officer, or by calling 9-1-1. Enjoy the festivities but when crossing tracks and streets, be aware and be safe. Take just a moment to stop and look both ways before crossing and make sure an umbrella, hood or other clothing doesn’t block your view of approaching trains, buses or autos. 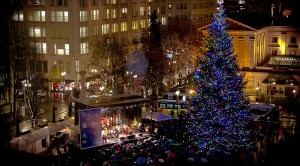 Portland’s holiday tree isn’t the only festivity lighting up the night on Friday, Nov. 27. The Oregon Zoo will be all aglow as the annual ZooLights switches on for the season beginning at 5 p.m. Take the MAX Blue or Red Line to enjoy the dazzling display, which runs through January 3, 2016. Get a discount on admission, up to $5, by taking transit to Zoolights. Learn more. Many ZooLights goers hop on MAX at the Sunset Transit Center Park & Ride, but on busy nights, especially nights the Portland Trail Blazers are playing at home, it can fill up fast. Consider using a parking lot further west such as our Millikan Way Park & Ride. Learn more about this parking option and others. For more holiday happenings around the area this season, check out our 2015 Holiday Events Guide on our How We Roll blog.